Yes, it should work. I have Win 7 64bit. Actually nothing works in my win7-64. I coped with installing the addon to Blender (2.54 beta. Not sure if it's suited for the stable 2.49 release which I prefer) I see it in 2.54 but nothing goes to 3dcoat after I push export button . 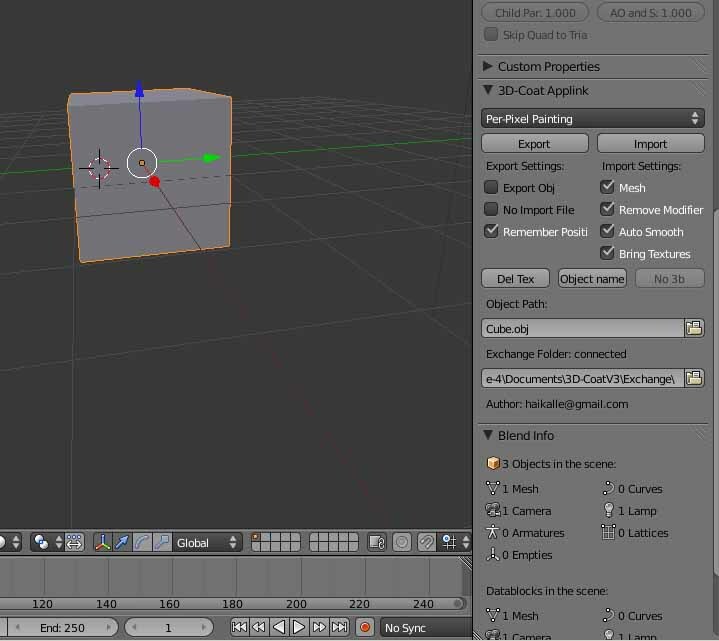 Is there a part that I have to install to 3dcoat so it would be aware of exporting from Blender? 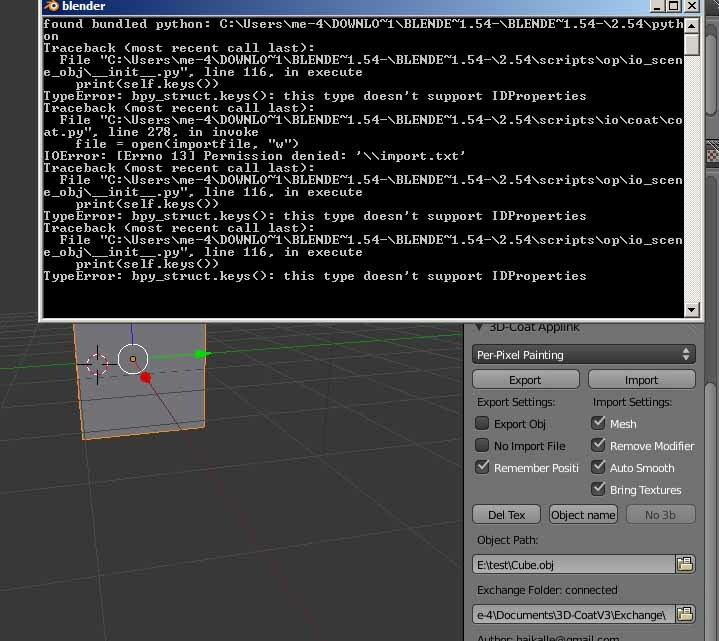 "Type error: bpy_struct.keys<>: this type doesn't support IDProperties"
Can you take a screenshot about the error box and also shot from you applink panel in blender. I haven't seen this kind of error. hmm. Which blender version number you are using and is it trunk version? I can see that there is only Cube.obj on object path. You need to set the full path of the object something like c:\temp\Cube.obj. Maybe this will fix the error. It's the last beta 2.54. Downloaded straight from blender.org. Not sure what trunk is actually. that gives a error then it is window 7 issue. No, it looks like not. Win7 allows to write in a user folder. 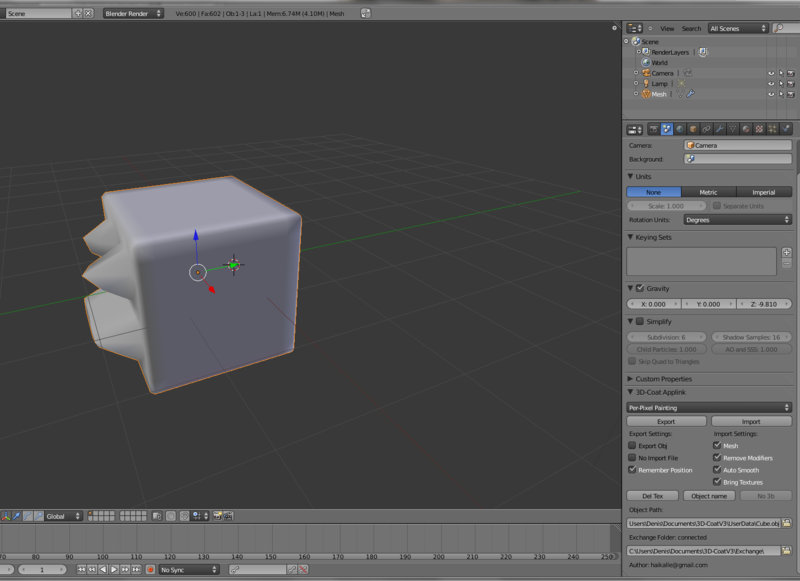 Also I have just tried to start Blender with administrative privilege. Nothing have changed. Maybe it's because I use zip file from Blender.org, not exe installer? okey, I hope I found the reason. The blender version you downloaded from blender.org is quite old version number. something like v.31878. The script dosen't work in that old. But from www.graphicall.org you can download the newer version. v.32615 and the script works with those newer versions. Here is blender link you can download. If i use the Export To > Blender option and select the location of the obj and overwrite it then it loads fine with the textures applied. It positions it slightly above the grid surface in blender though, if i click Import after on the applink options (in blender) the object lowers with the textures looking fine still. Now the part where you get a bug is if you now use the undo shortcut (Ctrl+Z) in blender as the textures will go but it will also sometimes distort the mesh. Other than the undo thing though the applink seems to work great now. Thanks Digital777. I will keep eye on undo issue. Undo is a little bit tricky right now and it's hard to make it to work nicely with the script. -Now 3d-coat -> Blender -> V-Ray workflow is very fast. Check out this video. Thanks, i don't own V-Ray but i am sure this would make anyone that has it very happy. This has given me the idea to try this applink with the freestyle version of blender to see if that works, it could have very cool results. By the way have you thought of trying to get this added to the main addons listing? That would be cool, it would mean we could then just download the latest blender builds and enable the addon making things even simpler and also more people would get to know about 3DC. Very nice and useful work! - Normal map gets applied but as type "bump". Should be type "tangent map"
I don't know in how far you can change these or if they are user error. 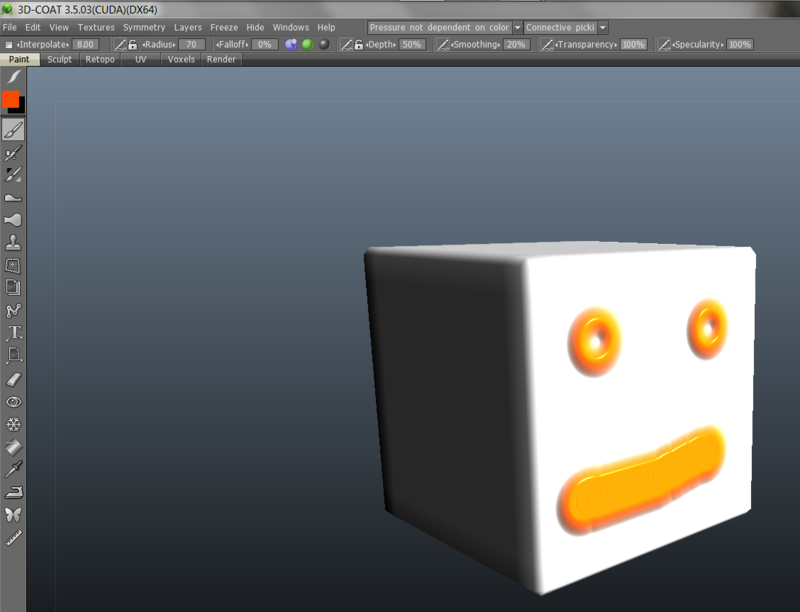 OK, the object rotation was my fault, swap x/y was checked on import. sure that you have choosen V-ray to render engine, before pressing import. And which blender version you have. You should use custom blender(V-Ray) version. As I said, the rotation thing was my fault. I am not sure if I've switched to VRay before or after importing, that could of course be a problem. 3. Open blender. Now you should be able to see 3d-coat applink area under the scene tab. don't have a clue how to do this! what is an exchange folder? sorry if i'm asking dumb questions. not connected into connected. Hope this helps but dont hesitate to ask if there is something odd still. don't know what I'm doing wrong?